Lantana is a workhorse of an annual. Tough on the hottest days, even in direct sunlight for several hours at a time. A versatile performer, Lantana is equally as nice in a porch pot, hanging basket, and planted in the landscape. 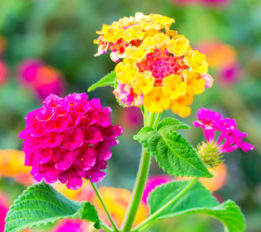 Lantana’s great paired with other heat tolerant annuals including geraniums, million bells, petunias, and any other annual that enjoys 4 or more hours of direct sunlight. Depending on the variety Lantana can serve as a Thriller, Filler, or Spiller. It also makes a striking addition to the landscape when planted directly into beds. The occasional deadheading keeps blooms looking fresh from spring until frost. 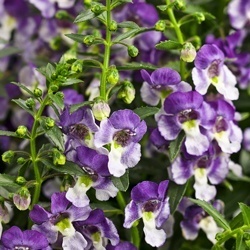 Also known as Summer Snapdragon, Angelonia is a must-have in porch pots. Angelonia holds up in any condition, with 4 or more hours of sun, and continues to bloom beautifully with very little deadheading. Some varieties make a nice Thriller in containers while shorter varieties work well as a Filler. A fantastic Filler! This drought tolerant favorite is a showstsopper. Easy to care for and no deadheading necessary. 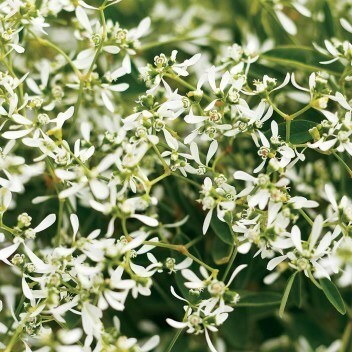 Many mistake Euphorbia for Baby’s Breath, which it closely resembles with its frilly, airy blooms. Euphorbia’s is a stand out in a porch pot mix. If anything, cold and wet is the only thing this plant won’t tolerate. Sun loving vinca virtually take care of themselves. Very little, if any, deadheading necessary. 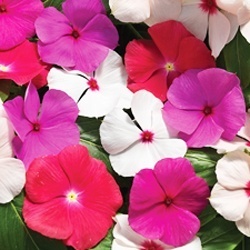 Vinca look especially nice planted in clusters in the landscape or as a porch pot filler. 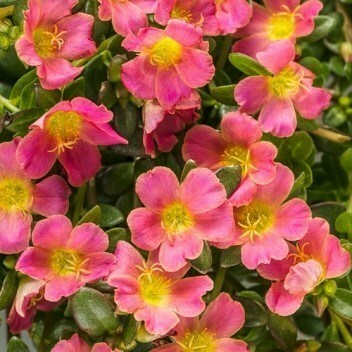 Portulaca is a fun Spiller plant that is super easy to grow in the hot hot sun. In fact, the sunnier the better! This dainty plant is deceiving because it’s more forgiving than meets the eye. Portulaca foliage is similar to succulent, waxy foliage.